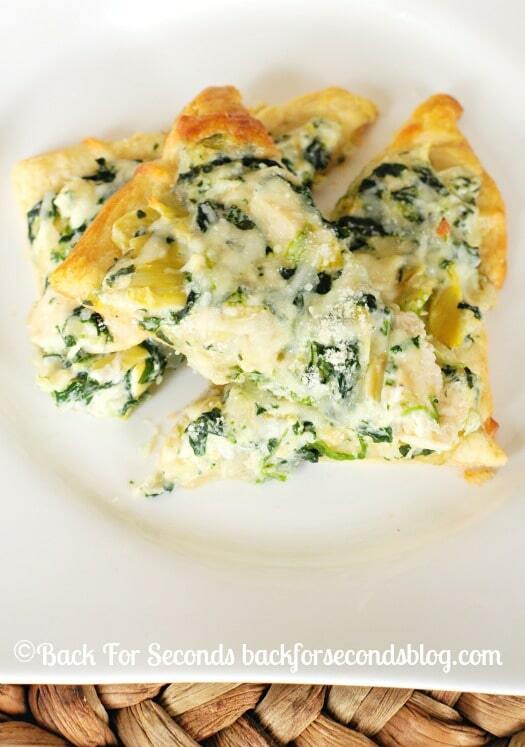 Spinach Artichoke Dip Pizza is a quick and easy meal that will leave your family begging for more! 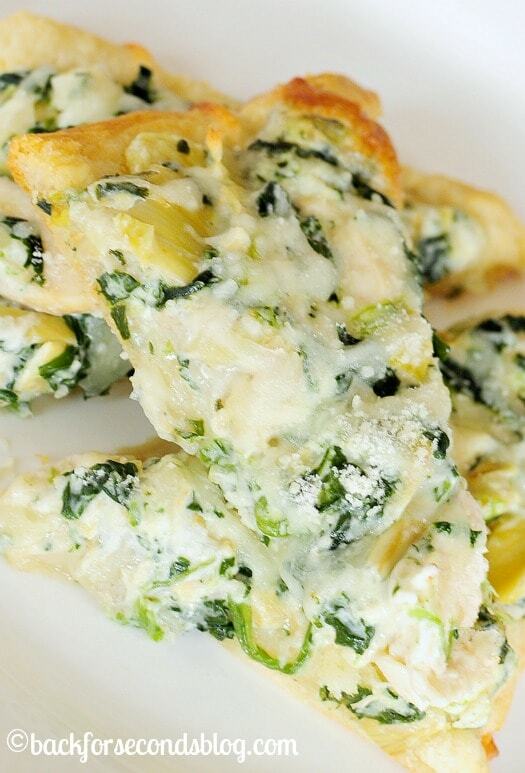 This Spinach Artichoke Dip Pizza is a combination of two of the most popular foods: Pizza and the best ever recipe for spinach artichoke dip! This is so crazy delicious, I could seriously eat it everyday! On Christmas I made a a couple giant loaves of stuffed spinach artichoke bread and ever since then I’ve been wanting to tweak the recipe a bit to turn it into a meal. I added chicken for extra protein and to make the pizza nice and hearty for my meat loving husband. If you want to keep it meat free though, I can promise that this is just as delicious without the chicken. This recipe is a good sized meal for four people and a perfect appetizer for eight people. We had this for dinner a few nights ago and I am already making it again tonight. I love your recipes/site. I am building a cookbook for my daughter and your recipes are becoming a large part of it. Thank you. Lovin’ this recipe. Can’t wait to make it as spinach dip is one of our favorites too! I wonder if you could make it a little healthier by switching out the mayo for plain yogurt? Thanks for posting to Recipe Sharing Monday. That sounds so good! I love the idea of using crescent rolls too! Hi! Stopping by from Saturday Night Fever:) This looks amazing!! Can’t wait to try it. These were very popular at the party I served them at. I thought there was a bit too much topping but they were still very yummy! Thanks for the recipe! 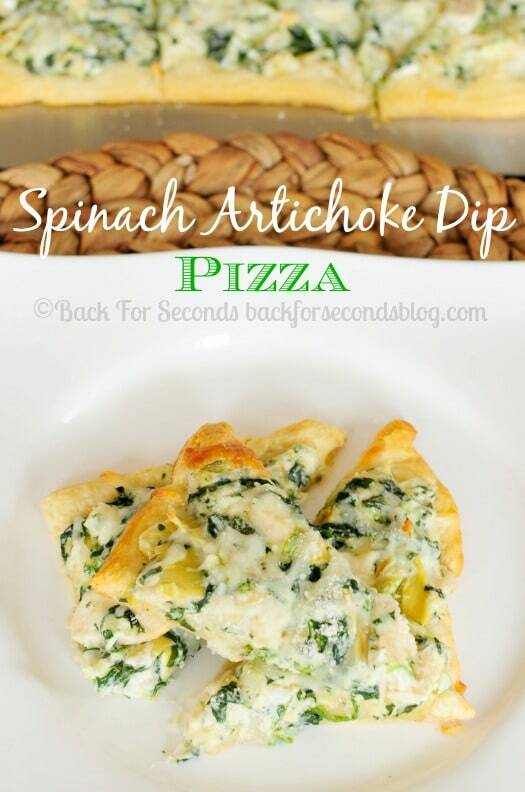 Spinach/artichoke dip is one of my favorite appetizers to order when eating out – I love the idea of a whole pizza of it!